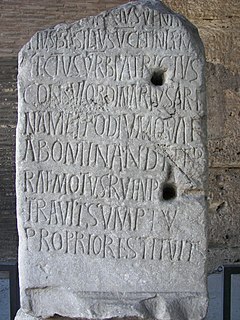 The Latin adverb sic ("thus", "just as"; in full: sic erat scriptum, "thus was it written")  inserted after a quoted word or passage indicates that the quoted matter has been transcribed or translated exactly as found in the source text, complete with any erroneous, archaic, or otherwise nonstandard spelling. It also applies to any surprising assertion, faulty reasoning, or other matter that might be likely interpreted as an error of transcription. An adverb is a word that modifies a verb, adjective, determiner, clause, preposition, or sentence. Adverbs typically express manner, place, time, frequency, degree, level of certainty, etc., answering questions such as how?, in what way?, when?, where?, and to what extent?. This function is called the adverbial function, and may be realized by single words (adverbs) or by multi-word expressions. A transcription error is a specific type of data entry error that is commonly made by human operators or by optical character recognition programs (OCR). Human transcription errors are commonly the result of typographical mistakes; putting one’s fingers in the wrong place while touch typing is the easiest way to make this error. Electronic transcription errors occur when the scan of some printed matter is compromised or in an unusual font – for example, if the paper is crumpled, or the ink is smudged, the OCR may make transcription errors when reading. On occasion, sic has been misidentified as an acronym (and therefore sometimes misspelled with full stops/periods): "s.i.c." is said to stand for "spelled in context", "said in copy", "spelling is correct", "spelled incorrectly", and other such folk etymology phrases. These are all incorrect and are simply backronyms from sic. An acronym is a word or name formed as an abbreviation from the initial components of a phrase or a word, usually individual letters and sometimes syllables. Folk etymology or reanalysis – sometimes called pseudo-etymology, popular etymology, or analogical reformation – is a change in a word or phrase resulting from the replacement of an unfamiliar form by a more familiar one. The form or the meaning of an archaic, foreign, or otherwise unfamiliar word is reanalyzed as resembling more familiar words or morphemes. Rebracketing is a form of folk etymology in which a word is broken down or "bracketed" into a new set of supposed elements. Back-formation, creating a new word by removing or changing parts of an existing word, is often based on folk etymology. Look up recte in Wiktionary, the free dictionary. Look up sic in Wiktionary, the free dictionary. In the English language, a split infinitive or cleft infinitive is a grammatical construction in which a word or phrase comes between the to and the bare infinitive of the to form of the infinitive verb. Usually an adverb or adverbial phrase comes between them. A bracket is a tall punctuation mark commonly used in matched pairs within text, to set apart or interject other text. The matched pair is best described as opening and closing. Less formally, in a left-to-right context, it may be described as left and right, and in a right-to-left context, as right and left. In English writing, quotation marks or inverted commas, also known informally as quotes, talking marks, speech marks, quote marks, quotemarks or speechmarks, are punctuation marks placed on either side of a word or phrase in order to identify it as a quotation, direct speech or a literal title or name. They are also used to indicate that the meaning of the word or phrase they surround should be taken to be different from that typically associated with it ; in this way, they are often used to express irony. They also sometimes appear to be used as a means of adding emphasis, although this usage is usually considered incorrect. A malapropism is the use of an incorrect word in place of a word with a similar sound, resulting in a nonsensical, sometimes humorous utterance. An example is the statement by baseball player Yogi Berra, "Texas has a lot of electrical votes", rather than "electoral votes". Malapropisms often occur as errors in natural speech and are sometimes the subject of media attention, especially when made by politicians or other prominent individuals. Philosopher Donald Davidson has said that malapropisms show the complex process through which the brain translates thoughts into language. Linguistic prescription, or prescriptive grammar, is the attempt to lay down rules defining preferred or "correct" use of language. These rules may address such linguistic aspects as spelling, pronunciation, vocabulary, syntax, and semantics. Sometimes informed by linguistic purism, such normative practices may suggest that some usages are incorrect, illogical, lack communicative effect, or are of low aesthetic value. They may also include judgments on socially proper and politically correct language use. In the English language, there are grammatical constructions that many native speakers use unquestioningly yet certain writers call incorrect. Differences of usage or opinion may stem from differences between formal and informal speech and other matters of register, differences among dialects, and so forth. Disputes may arise when style guides disagree with each other, or when a guideline or judgement is confronted by large amounts of conflicting evidence or has its rationale challenged. "Between you and I" is an English phrase that has drawn considerable interest from linguists, grammarians, and stylists. It is commonly used by style guides as a convenient label for a construction where the nominative/subjective form of pronouns is used for two pronouns joined by and in circumstances where the accusative/oblique case would be used for a single pronoun, typically following a preposition, but also as the object of a transitive verb. One frequently cited use of the phrase occurs in Shakespeare's The Merchant of Venice (1596–98). According to many style guides, the Shakespearian character who used the phrase should have written "between you and me". Use of this common construction has been described as "a grammatical error of unsurpassable grossness", although whether it is in fact an error is a matter of debate. In software, a spell checker is a software feature that checks for misspellings in a text. Features are often in software, such as a word processor, email client, electronic dictionary, or search engine. A barbarism is a non-standard word, expression or pronunciation in a language, particularly one regarded as an error in morphology, while a solecism is an error in syntax. The label was originally applied to mixing Ancient Greek or Latin with other languages. It expanded to indicate any inappropriate words or expressions in classical studies, and eventually to any language considered unpolished or rude. The term is used mainly for the written language. With no accepted technical meaning in modern linguistics, the term is little used by contemporary descriptive scientists. A compound modifier is a compound of two or more attributive words: that is, two or more words that collectively modify a noun. Compound modifiers are grammatically equivalent to single-word modifiers, and can be used in combination with other modifiers. Oxford spelling is the spelling standard used by the Oxford University Press (OUP) for British publications, including its Oxford English Dictionary (OED) and its influential British style guide Hart's Rules, and by other publishers who are "etymology conscious", according to Merriam-Webster. In English grammar, a flat adverb or bare adverb is an adverb that has the same form as a related adjective. It does not end in -ly, e.g. "drive slow", "drive fast". A flat adverb is sometimes also called simple adverb. Flat adverbs were once quite common but have been largely replaced by their -ly counterparts. In the 18th century, grammarians believed flat adverbs to be adjectives, and insisted that adverbs needed to end in -ly. According to the Merriam-Webster Dictionary, "It's these grammarians we have to thank for ... the sad lack of flat adverbs today". There are now only a few flat adverbs, and some are widely thought of as incorrect. Despite bare adverbs being grammatically correct and widely used by respected authors, they are often incorrectly stigmatized. There have even been public campaigns against street signs with the traditional text "go slow" and the innovative text "drive friendly". Disc and disk are two variants of the English word for objects of a generally thin and cylindrical geometry. The differences in spelling correspond both with regional differences and with different senses of the word. For example, in the case of flat, rotational data storage media the convention is that the spelling disk is used for magnetic storage while disc is used for optical storage. When there is no clear convention, the spelling disk is more popular in American English, while the spelling disc is more popular in British English. The full point, full stop or period is a punctuation mark. It is used for several purposes, the most frequent of which is to mark the end of a declaratory sentence ; this sentence-terminal use is properly, or the precise meaning of, full stop. This list comprises widespread modern beliefs about English language usage that are documented by a reliable source to be misconceptions. 1 2 3 4 5 6 7 8 9 Garner, Bryan A. (2001). "sic". A dictionary of modern legal usage (2nd ed.). USA: Oxford University Press. pp. 806–807. ISBN 978-0-19-514236-5. ↑ e.g. "Thefreedictionary.com" . Retrieved 2014-04-10. 1 2 3 William Coyle and Joe Law (2009). Research Papers. Cengage Learning. p. 72. ISBN 0-547-19081-6. ↑ Carillo, Jose A. (March 6, 2010). "The role of the bracketed 'sic' in English prose". The Manila Times . Archived from the original on May 27, 2012. ↑ Remero, Donald (May 9, 2010). "Quoting British / American English". ieosetta.com. Archived from the original on October 13, 2010. ↑ "Poor Grammar Makes Me Sic Sweatshirts & Hoodies". CafePress. Accessed: October 1, 2010. ↑ "Somewhat Topical Ecards". someecards.com. Retrieved October 1, 2010. 1 2 3 Arrivé, Lionel (2001). "Try Writing It in French or in Japanese". American Journal of Roentgenology. 176 (2): 548. doi:10.2214/ajr.176.2.1760548. PMID 11159116. 1 2 Jessen, Edward W. (2000). California Manual of Style: A Handbook of Legal Style for California Courts and Lawyers (4th edition) (PDF). pp. 132–133. Retrieved 2015-08-10. ↑ "Parentheses, Ellipses, and Brackets" (PDF). Writing Center. Johnson County Community College. Archived from the original (PDF) on 2012-08-31. Retrieved 19 November 2014. ↑ Wilson, Kenneth G. (1993). "sic (adv.)". The Columbia Guide to Standard American English. Columbia University Press . Retrieved 2009-11-03. ↑ Arrivé, L; Dono, P; Lewin, M; Dahan, H; Monnier-Cholley, L; Tubiana, JM (December 2001). "Taux de publication des travaux originaux présentés oralement lors des journées françaises de radiologie 1996" [Publication rate of papers originally presented at the national french congress of radiology in 1996]. Journal de Radiologie (in French). 82 (12): 1719–22. PMID 11917637. Archived from the original on 2011-10-04. ↑ Bruce Gustafson. JSCM Style Sheet . Journal of Seventeenth-Century Music, 2 January 2010. ↑ "Item 26 - 'Plan of space alongside Evinghews [sic: read Evening News] Printing Works and overlooked by St. Giles House University Hall', [Edinburgh]". University of Strathclyde Archives. Retrieved 19 November 2014.